Update: Congrats to Susan for winning the contest. The giveaway is closed. Back in September of 2009, in my overview of dried pasta entry, I made the claim that dry pasta is NOT inferior to freshly made pasta (this is the type of pasta which I often make at home with my classic, hand cranked, Imperia pasta machine). Don’t get me wrong, I love homemade pasta, especially ravioli, but I don’t exactly look forward to the work effort involved to make it at home. There’s the making of the dough, the flattening of the dough into sheets, cutting the pasta, and finally flowering and air drying the product. The process is messy and unless you make large quantities it’s tough to justify making pasta at home on a consistent basis (this is just one home cook’s opinion, of course). Enter the revolutionary idea of dry pasta. OK, maybe the idea of pre-packaged pasta isn’t revolutionary but it’s one of those food products that actually makes sense to acquire in an already completed fashion (read: not making it at home from scratch). Like so much of southern Italian life, the Arab invasions of the 8th century heavily influenced the regional cuisine and is the most accepted theory for the introduction of pasta. The dried noodle-like product they introduced to Sicily is most likely the origins of dried pasta and was being produced in great quantities in Palermo at this time. The modern word “macaroni” derives from the Sicilian term for making dough forcefully, as early pasta making was often a laborious daylong process. How it was served is not truly known but many Sicilian pasta recipes still include other Arab gastronomic introductions such as raisins and spices like cinnamon. This early pasta was an ideal staple for Sicily and it easily spread to the mainland since durum wheat thrives in Italy’s climate. Italy is still a major producer of this hard wheat, used to make the all-important semolina flour. By the 1300’s dried pasta was very popular for its nutrition and long shelf life, making it ideal for long ship voyages. Pasta made it around the globe during the voyages of discovery a century later. By that time different shapes of pasta have appeared and new technology made pasta easier to make. With these innovations pasta truly became a part of Italian life. Fast-forward 700 years or so and there are an abundance of dry pastas on the market in both the US and in Italy/Europe. The very best dry pastas are manufactured in Italy and are made with locally grown Durham wheat. The hard Durham wheat is what yields semolina flour, which is used in all types of quality dry pastas. In the US, the most common pasta brands are Ronzoni, Barilla, Colavita, De Cecco, etc. Of the brands found in the typical US supermarket, De Cecco, in my view, is the best choice. 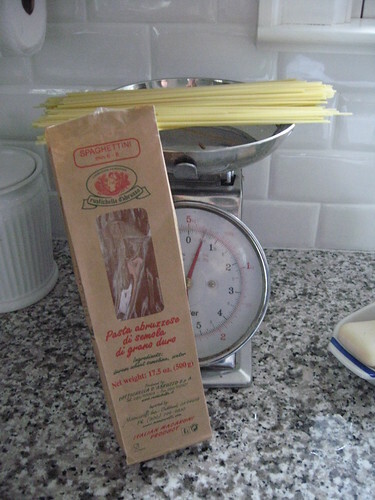 You can see De Cecco’s quality via it’s color and firmness out of the package and once you cook up a batch of linguine fine, for example, you can taste the quality in the semolina flour used. One readily available “luxury” pasta found at most Italian specialty shops (as well as Whole Foods) is a brand called, Rustichella d’Abruzzo. 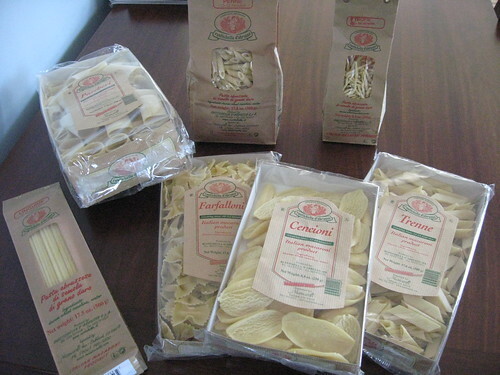 Rustichella sits along side other premium pasta brands such as Martelli, Latini, Benedetto, and Setaro. The premium pasta brands command prices as high as $8.80 for 18 ounces (Bendetto), for example. Rusticella pasta commands a price of about $6.60 per 18 ounces (a little over a full pound) and is priced in the middle of the luxury pasta segment. 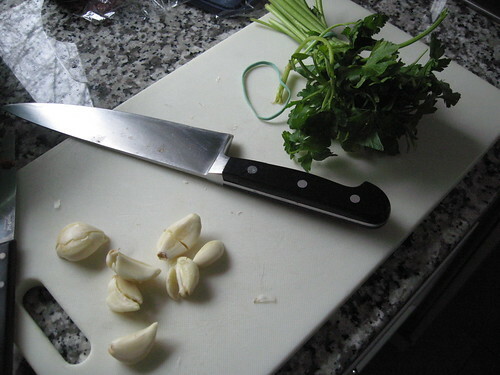 The first pasta I tried was spaghettini with a simple alio e olio sauce (olive oil, garlic, and parsley). I choose a simple sauce because I wanted the pasta to be the star and the Rustichella spaghettini didn’t disappoint. Unlike mass produced pasta brands, the Rustichella spaghettini had a wonderful texture and had none of the “cardboard-like” taste found in brands like Ronzoni. The spaghettini also had some wonderful nutty and malty flavor components, especially when sampling it without the sauce or condiment. 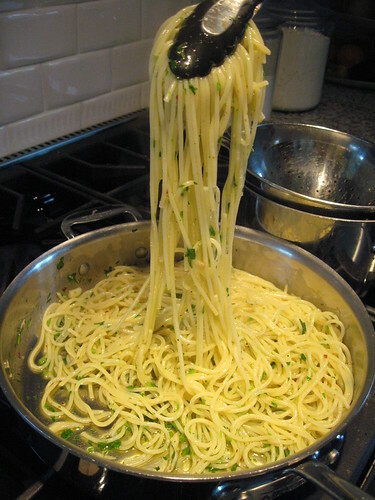 When I did mix the alio e olio with the spaghettini the pasta quickly absorbed the extra virgin olive oil and the tiny bits of parsley, garlic, and red pepper flakes hung closely to the pasta. 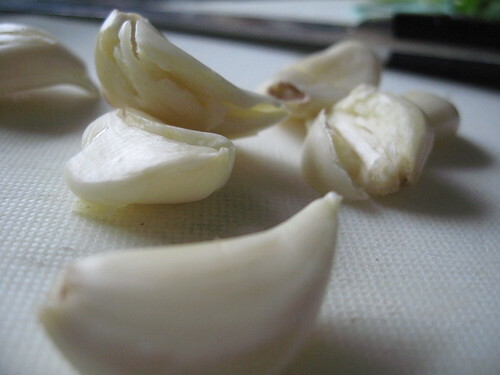 The idea of the sauce “sticking” or melding with pasta is a key concept and I look for this trait in any pasta. 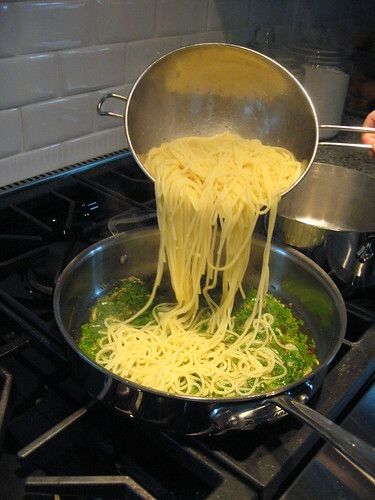 A high quality pasta should also allow for the sauce to integrate into the overall texture of the product (think of those nasty cream cheese and celery appetizers you may have consumed at cocktail parties; the celery, however unfortunate, is a vessel for cream cheese, just like a good pasta, fortunately, is a vessel for the sauce or condiment). 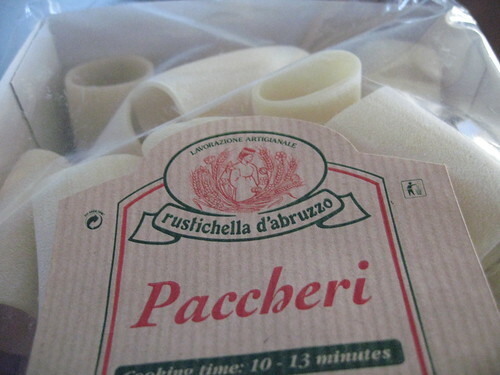 Next, I sampled the Paccheri (smaller, and plain, rigatoni – no ridges) with a tomato sauce and again the pasta shined. I was looking for the tomato sauce to slide off the pasta or for a little more blandness because of the larger size of the Paccheri, but the flavor was tremendous (kind of like a clean and crisp Sauvignon Blanc). My extended family sampled the rest of the Rustichella pastas and all but a few of the pasta critics enjoyed the high quality and texture of the product. Some of the more critical comments from family members centered on price point and similarity to De Cecco pasta. More specifically, one Uncle couldn’t justify price versus flavor (he was hinting at value and while he thought the product was of high quality he had concerns about why it was priced 2-3x that of other, typical, Italian brands like De Cecco). – Only one entry per person please. – The contest is open until 12 midnight on 2/6 and a single random user will be picked via Random.org. The winner will be announced immediately on Twitter (so please follow me) and on Scordo.com by 5PM on Monday, 2/8. – Please use a valid email address when leaving a comment so I can contact you just in case you’re the lucky winner (I’ll need your shipping address). – Manicaretti Italian Food Imports will send out the pasta package to the single contest winner during the week of 2/8. That’s it, so please sign up for a chance to win a sampler package of, quite possibly, one of the best food products on the planet (i.e., pasta)! 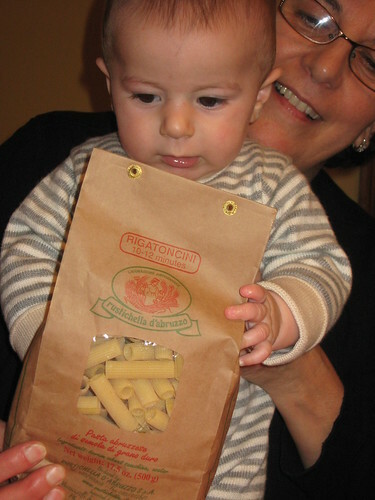 If you can’t wait to sample Rustichella pasta you can buy it online here! 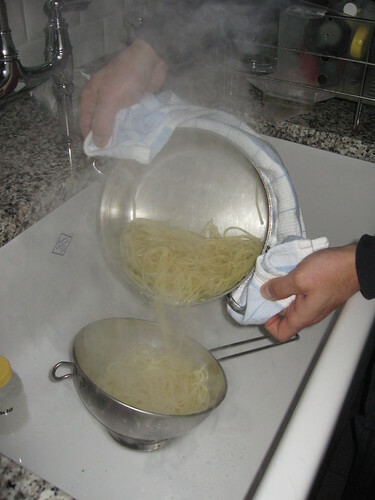 Also, be sure to search Scordo.com for a ton of pasta recipes! I have been somewhat obsessed with fresh homemade pasta for years–ever since I first saw Mario Batali make that first ‘well’ on the Food Network. I use fresh pasta for lasagna, manicotti, cannelloni, ravioli, and sometimes fettucini, and I do think fresh pasta is much lighter and more tender. But for all other pasta’s I use dried. I particularly like campanelle, and gemelli depending on the sauce, and while I’ve never used Rustachella, it’s only because it’s not available in my hometown. Right now I have “Taste of Inspirations” product of Italy distributed by DZA Brands in my cabinet. Barilla is probably the brand I most often use. For dried pastas, I think the trick is to choose the right size and shape for the sauce, and then cook al dente and add to the sauce to finish. Pick one favorite shape Vince? How about a top ten favorite shapes instead? Lately I’m very much in love with rigatoni; I’ve always had it with vodka sauce, but recently my wife and I prefer it with sausage and broccoli rabe. As for brands, DeCecco and Barilla are favorites, but Delverde makes a killer tagliatelle that’s almost like homemade! Try it if it’s available in your area. Like Annelle above, my family likes to make homemade for manicotti and lasagna. I used to help my nonna and my great aunt make this, and with the leftover dough we would change the setting on the machine and make a little fresh fettucine to boot! Although I thought I was already a fan of the FB page, I am now! Thanks for the opportunity to win this great brand. Hi Annelle, thanks for the comment! I agree that homemade pasta comes across as being more tender and lighter. 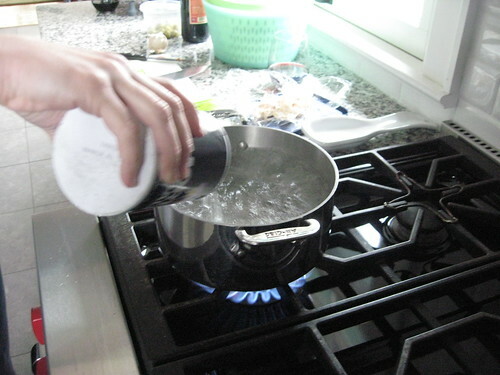 And your tips on cooking dried pasta are correct, I would add that one should use lots of water and salt during the cooking process. Shape is vital when pairing with the condiment or sauce! Right now I have about 8 different pasta types in my kitchen. And, yes, I agree it’s hard to pick just one! My favorite is large rigatoni (do you prefer these or the smaller type?). Try Rigatoni with a good extra virgin olive oil and plenty of grated cheese and freshly ground pepper. 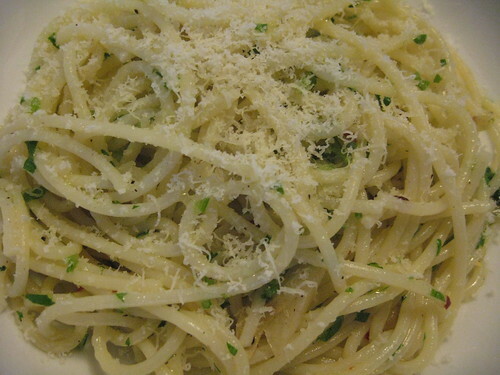 If you’re in the mood for long pasta try linguine with fresh ricotta, black pepper, and olive oil. Oh, I would LOVE this. I could eat pasta for every meal and be happy. I love penne and farfalle, but I’ve only really tried Barilla because it’s what we can get here. We don’t live close enough to a special market or even a Whole Foods to be able to try the more rustic stuff. I’ll have to keep an eye out at the grocery store for more rustic pastas. These look incredible. Well- I would have to say my favorite pasta would have to be Linguine. I have used Barilla forever and really love it- although I just got the pasta attachment for my Kitchen Aide as a Christmas present and I am determine to perfect my own homemade linguine. I am a facebook fan and I will re-tweet this ! Thanks for the chance to win some yummy new pasta! Pasta is a big staple at our house. One of my hubby’s favorite foods is homemade lasagna. 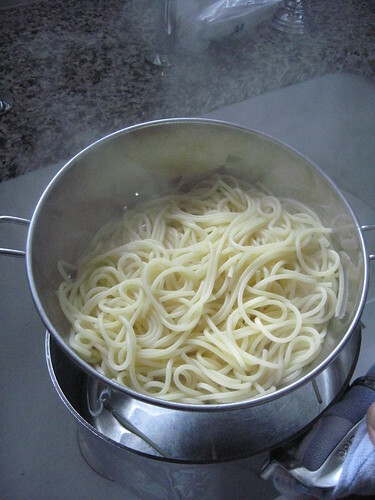 Personal favorite pasta is De Cecco Capellini. I’ve toyed with making my own pasta but it may need to wait until our twins are a bit older and I have the time and energy. LOL Love the blog and already follow using my Google reader. and Fresh Spinach. Served over Pappardelle and topped with crumbled Feta Cheese. I buy my Rustichella from Amazon in 4-pks with free shipping. It’s less than $5 a pack with machine made shapes at 500gm and hand-made shapes at 250gm. 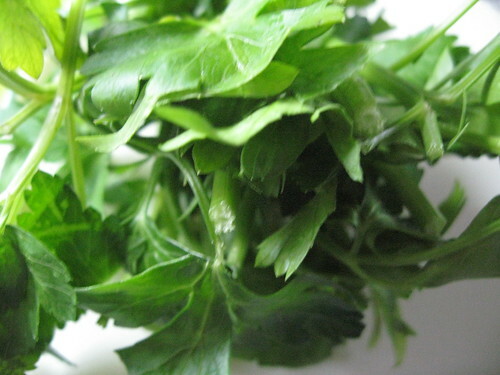 My favorite shape is the hand-made Sagne Incannulate, which is great with pesto. You’re right, sometimes it’s even better. It all depends whtat you are eating. 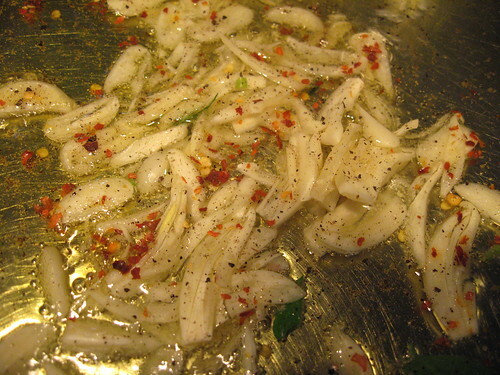 Aglio olio & pepperoncino usually needs dried pasta. I really could not imagine eating it with anything other than spaghetti or a similar, long dried pasta. After a long trip we usually pull out the dried spaghetti for aglio olio e pepperoncino, or just butter and aged parmesan. Silvia says that it makes her feel like home. I’m late on this train, lol but thanks for this great review, etc. – I hope to try and find this pasta and may order it online to give it a try. My local supermarket here in the Hudson Valley sells Gia Russa and I find it to be really, really good – better than most others I can find here. Have you heard of the brand? I’m really enjoying your blog as it’s new to me and look forward to reading and following along, Vince. Just thought I would drop you a note- I made the Rustichella d’Abruzzo linguini that I won last night. I threw together a little olive oil and garlic, added some anchovies and some artichoke hearts and threw it all together- the pasta was spectacular! My husband loved it too. I am so grateful that I won- now I cant wait to create something for the other 3 pastas! That’s great and so glad you liked the linguine. Let me know what sauces you make for the other shapes. Your photos are incredible! They make me want to eat pasta NOW!! Now I am very curious about your Rustichella I have never tried it. looks delicious Vince… and a great post! I’m a fan of De Cecco too. I also like Delverde Spaghetti #4. Good to hear from you! De Cecco is nice and the price point is good, Delverde is a good brand as well. There’s something about the winter and pasta consumption – that is to say, it only increases for me!